Peak Sensors works closely with many companies involved in the petrochemical, oil and gas industries. 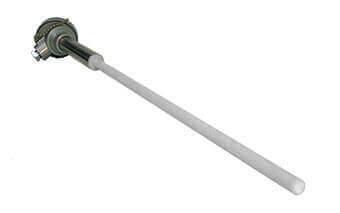 We supply temperature sensors directly to chemical manufacturers and also to plant suppliers and service providers. We supply temperature sensors using existing drawings and specifications and also work with chemical manufacturers to develop new temperature sensors for new technologies and catalyst systems. These custom projects have given us significant manufacturing advantage over other sensor manufacturers. We supply all types of thermocouples, resistance thermometers and related equipment to the chemical, oil and gas industry . 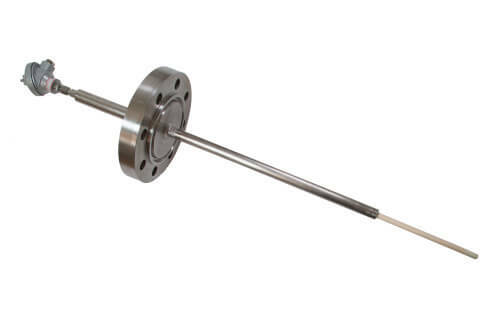 CO reactor thermocouples are often called POX probes. They are used in chemical plants manufacturing various gases such a carbon monoxide and syngas. We have been manufacturing CO reactor thermocouples for many years. Details specifications can be found here. Multipoint Thermocouples for Catalyst Tank Profiling. A multipoint temperature sensor can also consist of many different sensors fixed to a single flange for a single point of entry into a process. 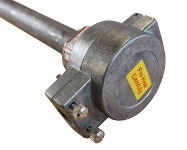 We have supplied multipoint thermocouple sensors with up to 60 individual sensors passing through a single flange. This has been done with a double pressure sealing arrangement. 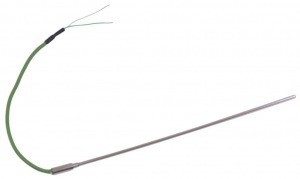 The multipoint thermocouple was used in a Vinyl Acetate Monomer (VAM) reaction vessel. View more details. The sensor can be protected by a ceramic sheath. There are a variety of ceramic sheaths available each with its own properties. The sensor can be protected by a stainless or metal alloy sheath. These types of designs are often used in cement works or incinerators. The sensor can be protected by a ceramic sheath with a platinum thimble at the hot end. This design is often used in container glass forehearths to take uniformity measurements but can be applied to other applications if suitable. If required the sensor can be protected by a full length platinum thimble. It is a more robust design of the Rare Metal Thermocouple Assembly with Platinum Thimble. A very common robust sensor with a wide range of applications. 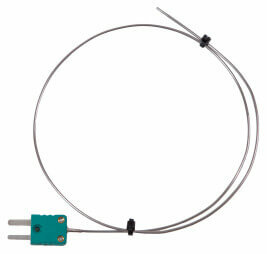 Also known as “bare leads” thermocouple. This standard design can be altered in accordance with IP65 and is very suitable for insertion into a pocket. The standard plug enables the temperature sensor to be easily connected and disconnected to a variety of controllers and readouts in busy and demanding environments. The miniature plug enables the temperature sensor to be easily connected to a variety of hand held instruments and read outs. This is a variation on the MI Thermocouple with Pot Seal & Tails. It comes with a longer cable and is often used in original equipment manufacture. We’ve made temperature sensors for the chemical, oil and gas industries for over 20 years and today we are considered the best choice for custom built temperature sensors in the UK. We continue to apply our expertise and invest in the latest technology to provide our customers with the highest quality temperature sensors available.